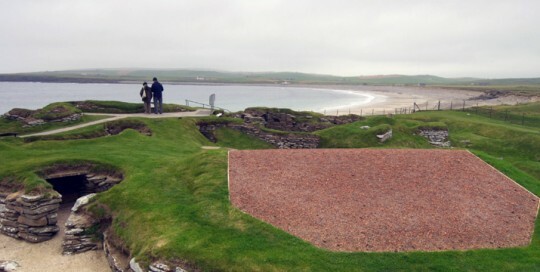 FDT harnessed the most modern roofing materials and advanced 21st century technological know-how to help preserve one of Europe’s most remarkable ancient monuments, 5,000-year-old Skara Brae. The designated World Heritage Site, a fascinating commune of small interlinked stone dwellings, is one of the most-visited tourist attractions on the historic Orkney islands and offers up to 60,000 visitors a year an unparalleled taste of life in Neolithic Orkney. With the site at the mercy of the fierce coastal elements, Historic Scotland, who care for the attraction, called on FDT to help overcome an unusual problem. Neolithic carvings beneath the glass viewing roof of one of its famous domed homes were threatened by an unstable environment. Rhepanol hg was chosen to create a new watertight garden roof that blends in aesthetically and could be left undisturbed for up to 50 years. 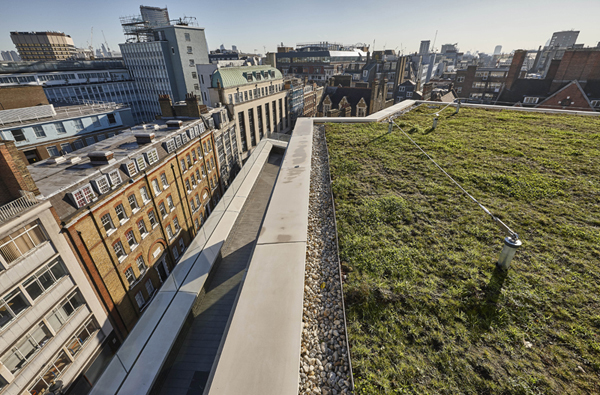 Green roofing forms a key part of roof design as part of a model for sustainable living in 21st century London. 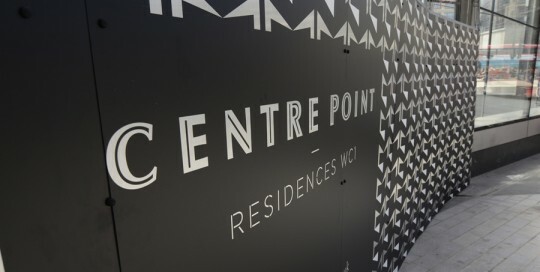 Barking Riverside is a joint venture project between Bellway Homes and the Homes & Community Agency. It is an element of the Mayor of London’s plan to build 10,800 new homes, retail, transport links and new town facilities in the Barking region of East London. 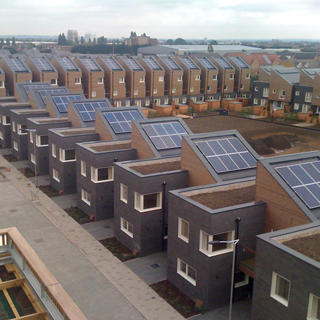 Green roofing was specified for some 50 homes each with a green roof area of 20m2, plus a block of flats with a roof area spanning 2100m2 which comprises 1500m2 green roofing plus gravel margins. 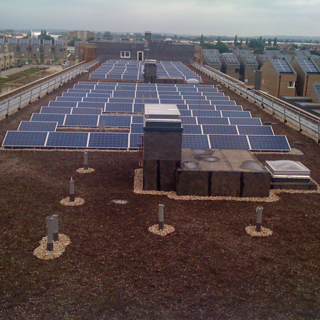 SIG accredited roofing contractors Albany Brent Ltd of Walthamstow were chosen to undertake the green roofing works at Barking Riverside as they have substantial experience in both green and brown roof systems. 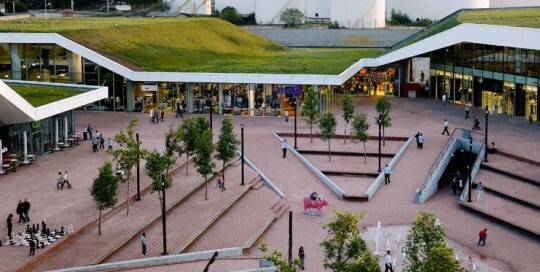 SIG Design & Technology designed an inverted roof, waterproofed in Rhenofol CG. Suitable for green roofing projects, the membrane system resists weathering, chemical oxidation and UV radiation, and retains its physical properties over a wide range of temperatures. The polyester fleece backing can be bonded or loose-laid when ballasted. 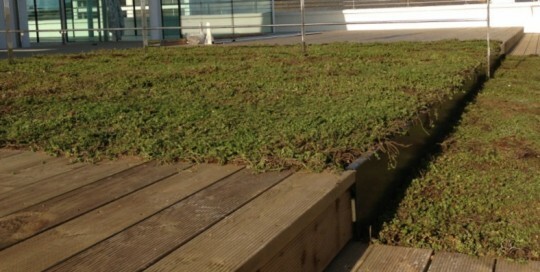 As part of SIG’s recommended roof build up, a plug planted sedum roof system provides the green roof finish. Suitable for both new-build and refurbishment, the system comprises diverse species of hardy, succulent plug plants and native wild flowers which are installed at a density of 20 per m2 to provide a maximum of 10% plant coverage at installation. FDT played a key role in reshaping the urban landscape of Turkey’s most crowded city. The vast 70,000sqm M1 Meydan Umraniye shopping and leisure complex, in Istanbul, is the country’s first shopping centre to feature a green roof – at 54,000sqm the largest of its kind. Opened to the public in June 2007, the €34m Istanbul shopping centre has been hailed as one of the most exciting additions to Istanbul in modern times. 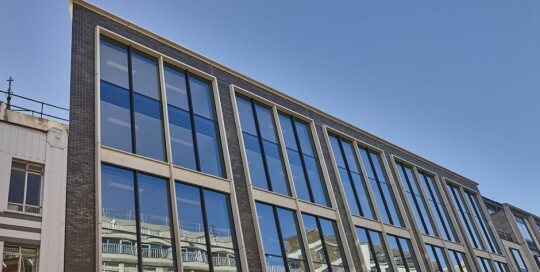 The pioneering design won the process category of the 2008 European Business Awards for Environment for the geothermic technology used throughout the building. FDT brought more than 30 years of technological expertise to the entire roofscape with its most advanced membrane, Rhepanol hg. 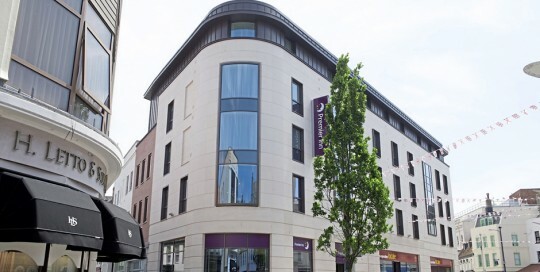 Rhepanol hg was specified because it provides a completely waterproof and root-resistant cover, allowing the roof to be planted up and thus offsetting some of the development’s carbon emissions. 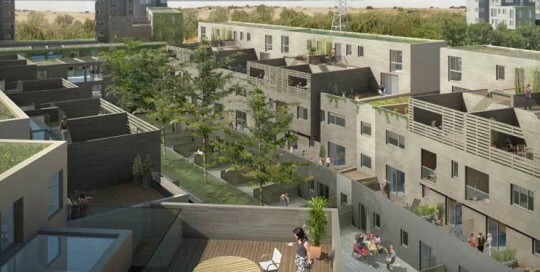 Some 35,000sm of flat and sloping roofs were planted with vegetation, providing a much-needed rooftop green oasis for the city’s 14 million residents. The remaining 20,000sqm is gravelled to provide a public square – complete with lush vegetation and a water feature which can be used as a skating rink in winter. Rarely included in building contracts are specifications allowing roof top access for climbing goats. But that is exactly what Newcastle-based contractor Redhead Roofing LLP faced after winning a contract to install the green roof system for a new build visitor centre and cafe, called Goats on the Roof, at Fontburn near Rothbury. IKO Spectraplan SM120 dark grey was specified and installed to the 300m2 roof area, ready to receive a green roof system. 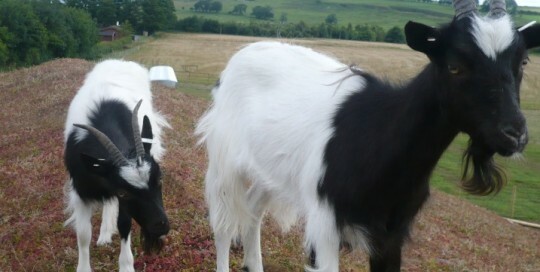 The system provides a sustainable green roof covering and provides the perfect playground for a rare breed of climbing goat called the Bagot, resident at Fontburn. Fitting a system which allows goats to access and climb around the roof top certainly is a unique job and the most unusual challenge faced by Redhead Roofing in the company’s 25 year history. Spectraplan is only available in the UK from SIG Design & Technology and can only be installed by an IKO Single Ply trained and licensed contractor. Sandbanks Dorset has become a popular location for the rich and famous and this one-time sand-dune shanty town is now being described as the UK’s answer to Monte Carlo. With its pristine golden sand beaches and its Mediterranean like climate, it has quickly established itself as a millionaires’ playground. Sandbanks Court apartments are situated within the expensive up-market area of this coastal peninsular and enjoy spectacular panoramic views across the sea. A green roof system was selected for this project as the client required a roof that would complement and accommodate the step in levels to follow timber decking lines to the 55m² roof terrace areas. IKO Single Ply’s Spectraplan SM120 light grey single ply waterproofing system was overlaid to the existing roof and newly built sun rooms, ready to receive a green roof system. Offering exceptional mechanical strength, enhanced UV stability and long term waterproofing performance, the Spectraplan TPE system offers the most advanced polymer technology available in the industry. Safe, reliable welding characteristics make it the material of choice for complex roof structures and those requiring rapid installation. The external roof area has proved a real success with its users and they can now enjoy the new found lease of life to their rooftop with a view of the Dorset Coastline. Green roofs offer multiple benefits for both the environment and the building occupants including, improved air quality and aesthetic appearance, better thermal and acoustic performance and increased roof life expectancy. These extensive systems can be installed on a wide range of buildings, including schools, houses and commercial offices. A stunning new ‘brown roof’ is the crowning glory for a private dwelling overlooking the River Tweed. The project has been designed to last 100 years and takes into account the requirements of future generations of the family. The house is the first to be constructed in the UK with zero heating requirements using the mass timber Brettstapel technique. Passive technologies such as orientation for daylight and solar gain, super insulation and air-tightness levels have been utilised in order to achieve the internationally recognised Passivhaus standard. The main superstructure was prefabricated in Austria and shipped to the site in the Borders area of Scotland. 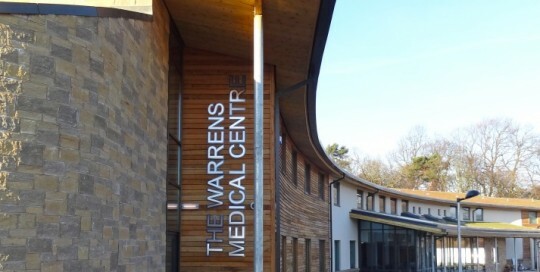 For the roof, the client wanted to mimic the existing gorse land environment to lessen the visual impact and a brown roof system was chosen for suitability. 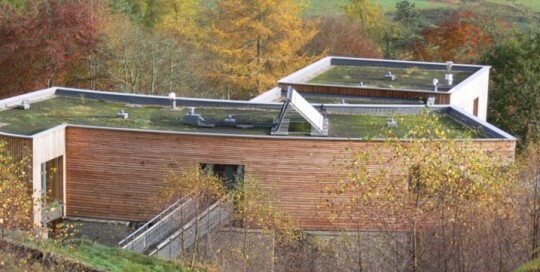 A brown roof, also referred to as a Bio-diverse roof, would provide a habitat capable of supporting wildlife as well as enhancing the appearance. For the main flat roof area, Spectraplan TPE SG120 Light Grey single ply membrane was installed. Spectraplan TPE membranes are free of halogens (Chlorine, Fluorine, Bromine and Iodine), softeners, (H)CFCs and heavy metals, fitting in with the green credentials on the property. A brown roof system was laid on top of the single ply membrane.